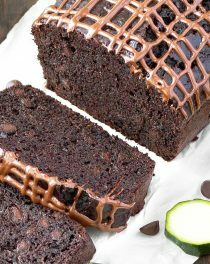 In the summer, there is nothing more satisfying than simple meals that require little or no cooking. I make salads a few times a week, often with whatever I have on hand. 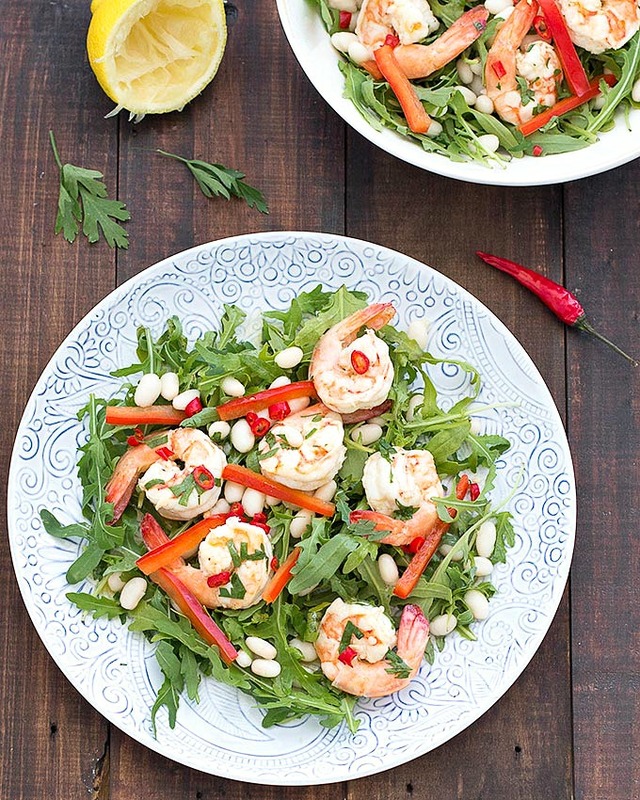 This spicy shrimp arugula cannellini salad is super tasty, satisfying and filling. The salad consists of only three ingredients tossed in a simple lemon chili dressing that let the flavors shine through. Start by marinating the shrimp with olive oil, lemon juice, lemon zest and parsley. Let them sit for a few minutes before throwing them on the grill or cooking them in a frying pan. You can even cook the shrimp in advance, the rest of the salad takes less than five minutes to put together so you’ll be out of the kitchen in no time. 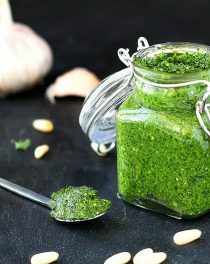 If you don’t like arugula, replace it with baby spinach or watercress. I love adding red pepper to salads as it gives the perfect crunch and sweetness. I’m too lazy to prepare dried cannellini beans so I’ve used canned. Just remember to rinse them thoroughly. The lemon chili dressing is super easy to make. 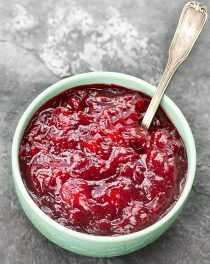 You mix all the ingredients in a jar, this way you can shake it up easily and keep any leftover in the fridge. Combine the prawns, olive oil, lemon juice+zest, parsley, salt and pepper. Let it sit for 5 minutes then cook the prawns on a grill or in a frying pan, for 4-5 minutes or until they are cooked through. In a large bowl, combine the arugula, red pepper and cannellini beans. Top with prawns and drizzle with dressing.Toss gently and serve. 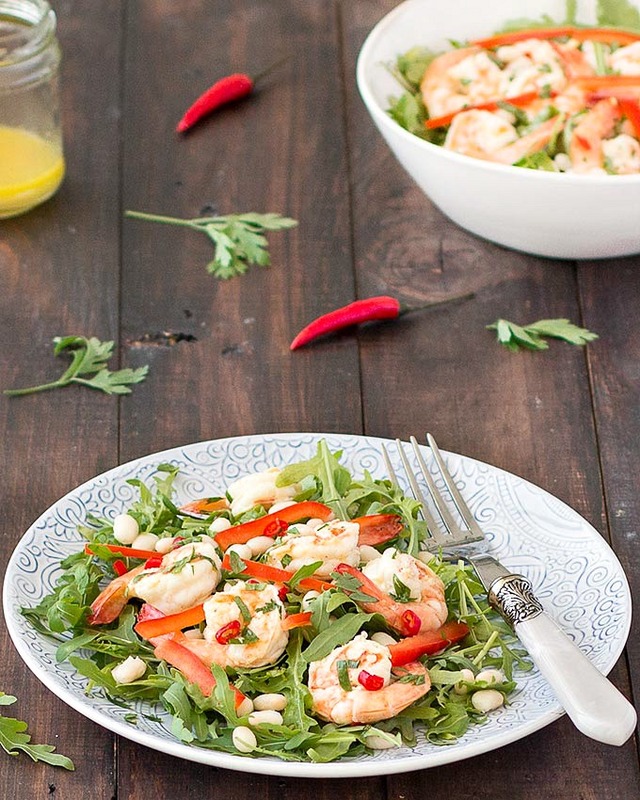 Enjoy this spicy shrimp arugula cannellini salad!